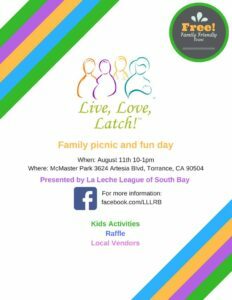 Live, Love, Latch! is a National Breastfeeding Month celebration to not only celebrate breastfeeding, but to also highlight our community support. This will be our second annual event here in the South Bay! If you are interested in sponsoring our event and/or donating to our silent auction, please fill out our vendor form here.